I am not a salad person. Heck, I'm not a vegetable person. 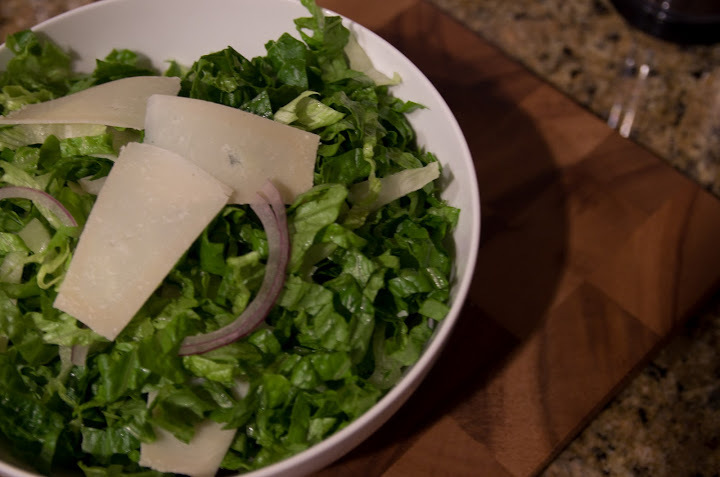 Cheese, pizza and bacon top the list of my favorite foods, but sometimes a meal needs a leafy green salad. Thanks to a trick that my friend Joanna taught me, I've found a salad that I make not because I feel like I have to, but because I actually enjoy it. Salad Prepped - Waiting to be Dressed at the Pizza Party! The simple trick that Joanna taught me-- you chiffonade the lettuce. Yeah, yeah, I know you're thinking "how can the way you cut the lettuce, make it taste better?" Well, I don't know how, but I know it definitely does! With a sharp knife, cut the lettuce into strips as thin as you easily can-- try it! This is just what I used, but obviously toss in whatever you love. Just make sure you chiffonade the lettuce! Whisk everything together and toss with the lettuce right before serving. 1 comment on "A Simple Salad"
Wow! I did not know there was a word to describe how I cut lettuce. And so funny that we cut our lettuce the same way.